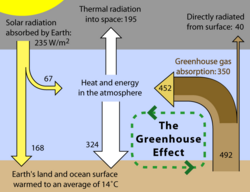 The greenhouse effect is the process in which long wave radiation (infrared) emitted by the earth surface is absorbed by atmospheric gases only to cause further emission of infrared radiation back to the earth, warming its surface. The major atmospheric gases causing such greenhouse effects are water vapor (H2O), carbon dioxide (CO2), methane (CH4), ozone (O3), nitrous oxide (N2O), chlorofluorocarbons (CFCs), and perfluorocarbons (PFCs); they are known as greenhouse gases (GHGs). The Earth's average surface temperature of 15°C (288 K) is considered to be about 33°C warmer than it would be without the greenhouse effect (IPCC 2007). The greenhouse effect was discovered by Joseph Fourier in 1824 and first investigated quantitatively by Swedish chemist Svante Arrhenius in 1896. Compared to the Earth, Mars shows very weak and Venus very strong greenhouse effects, as a result they have low and very high surface temperature, respectively. The effect is derived from the greenhouse, as the warming of air inside a greenhouse compared to the air outside was supposed to take place in similar way. The greenhouse effect is an important natural phenomenon allowing maintenance of a comfortable average temperature on the earth. A recent gradual warming of the Earth, generally known as global warming, is popularly considered to be the result of increased concentrations of greenhouse gases in the atmosphere as a result of human activities since the industrial revolution (Miller 2000), although there are divergent opinions among scientists regarding whether, or to what degree, temperature changes represent natural cycles or are anthropogenic in nature. A schematic representation of the exchanges of energy between outer space, the Earth's atmosphere, and the Earth surface. The ability of the atmosphere to capture and recycle energy emitted by the Earth surface is the defining characteristic of the greenhouse effect. Solar radiation at top of atmosphere and at Earth's surface. The Earth receives energy from the Sun in the form a wide spectrum of electromagnetic radiation. However, over ninety percent of the Sun's radiation is in the form of visible light and infrared. The Earth reflects about 30 percent of the incoming solar radiation; thus, the albedo (total reflectivity) value of the earth is 0.3. The remaining seventy percent is absorbed by atmosphere (19 percent), and by land and water (together 51 percent), warming the atmosphere, land, and oceans. For the Earth's temperature to be in steady state so that the Earth does not rapidly heat or cool, the absorbed solar radiation must be very closely balanced by energy radiated back to space in the infrared wavelengths. Since the intensity of infrared radiation increases with increasing temperature, one can think of the Earth's temperature as being determined by the infrared radiation needed to balance the absorbed solar flux. The visible solar radiation mostly heats the surface, not the atmosphere, whereas most of the infrared radiation escaping to space is emitted from the upper atmosphere, not the surface. Thirty percent of the solar flux is absorbed by the earth’s surface and transferred to the atmosphere in the form of latent heat of vaporization during evaporation to be dissipated into the space as infrared waves. The remaining twenty one percent solar flux absorbed by the surface is emitted in the form of infrared photons; but they are mostly absorbed in the atmosphere by greenhouse gases and clouds and do not escape directly to space. The downward long–wave radiation occurs mostly from the atmosphere. This delayed dissipation of the solar flux due to greenhouse effect is responsible for warming effect. The reason this warms the surface is most easily understood by starting with a simplified model of a purely radiative greenhouse effect that ignores energy transfer in the atmosphere by convection (sensible heat transport) and by the evaporation and condensation of water vapor (latent heat transport). In this purely radiative case, one can think of the atmosphere as emitting infrared radiation both upwards and downwards. The upward infrared flux emitted by the surface must balance not only the absorbed solar flux but also this downward infrared flux emitted by the atmosphere. The surface temperature will rise until it generates thermal radiation equivalent to the sum of the incoming solar and infrared radiation. A more realistic picture taking into account the convective and latent heat fluxes is somewhat more complex. But the following simple model captures the essence. The starting point is to note that the opacity of the atmosphere to infrared radiation determines the height in the atmosphere from which most of the photons are emitted into space. If the atmosphere is more opaque, the typical photon escaping to space will be emitted from higher in the atmosphere, because one then has to go to higher altitudes to see out to space in the infrared. 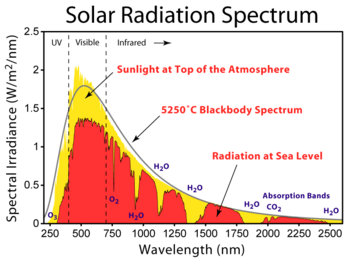 Since the emission of infrared radiation is a function of temperature, it is the temperature of the atmosphere at this emission level that is effectively determined by the requirement that the emitted flux balance the absorbed solar flux. But the temperature of the atmosphere generally decreases with height above the surface, at a rate of roughly 6.5°C per kilometer (km) on average, until one reaches the stratosphere 10–15 km above the surface. (Most infrared photons escaping to space are emitted by the troposphere, the region bounded by the surface and the stratosphere, so we can ignore the stratosphere in this simple picture.) A very simple model, but one that proves to be remarkably useful, involves the assumption that this temperature profile is simply fixed by the non–radiative energy fluxes. 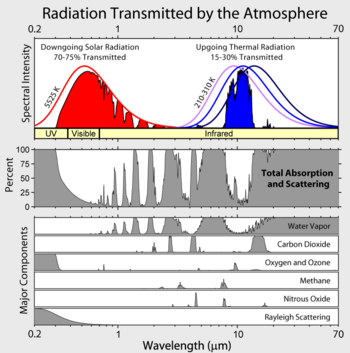 Given the temperature at the emission level of the infrared flux escaping to space, one then computes the surface temperature by increasing temperature at the rate of 6.5°C per kilometer, the environmental lapse rate, until one reaches the surface. The more opaque the atmosphere, and the higher the emission level of the escaping infrared radiation, the warmer the surface, since one then needs to follow this lapse rate over a larger distance in the vertical. While less intuitive than the purely radiative greenhouse effect, this less familiar radiative–convective picture is the starting point for most discussions of the greenhouse effect in the climate modeling literature. The term "greenhouse effect" originally came from the greenhouses used for gardening. A greenhouse is built of glass, which is transparent to electromagnetic radiation in the visible part of the spectrum and not transparent to either side of the visible range (ultra violet and infrared). However, in reality the greenhouse heats up primarily because the Sun warms the ground inside it, which warms the air near the ground, and this air is prevented from rising and flowing away (Fraser). The warming inside a greenhouse thus occurs by suppressing convection and turbulent mixing. Greenhouses thus work primarily by preventing convection (Wood 1909), just like the solar water heater. However, the atmospheric greenhouse effect of the Earth reduces radiation loss, not convection (JEB 2002). Pattern of absorption bands generated by various greenhouse gases and their impact on both solar radiation and up–going thermal radiation from the Earth's surface. Note that a greater quantity of up–going radiation is absorbed, which contributes to the greenhouse effect. The molecules/atoms that constitute the bulk of the atmosphere—oxygen (O2), nitrogen (N2), and argon—do not interact with infrared radiation significantly. While the oxygen and nitrogen molecules can vibrate, because of their symmetry these vibrations do not create any transient charge separation. Without such a transient dipole moment, they can neither absorb nor emit infrared radiation. In the Earth’s atmosphere, the dominant infrared absorbing gases are water vapor, carbon dioxide, and ozone (O3). The same molecules are also the dominant infrared emitting molecules. Quantum mechanics provides the basis for computing the interactions between molecules and radiation. Most of this interaction occurs when the frequency of the radiation closely matches that of the spectral lines of the molecule, determined by the quantization of the modes of vibration and rotation of the molecule. Generally, the electronic excitations do not occur due to infrared radiation, as they require energy larger than that in an infrared photon. The width of a spectral line is an important element in understanding its importance for the absorption of radiation. In the Earth’s atmosphere these spectral widths are primarily determined by “pressure broadening,” which is the distortion of the spectrum due to the collision with another molecule. Most of the infrared absorption in the atmosphere can be thought of as occurring while two molecules are colliding. The absorption due to a photon interacting with a lone molecule is relatively small. This three–body aspect of the problem, one photon and two molecules, makes direct quantum mechanical computation for molecules of interest more challenging. Careful laboratory spectroscopic measurements, rather than ab initio quantum mechanical computations, provide the basis for most of the radiative transfer calculations used in studies of the atmosphere. CO2 and O3 have "floppy" vibration motions whose quantum states can be excited by collisions at energies encountered in the atmosphere. For example, carbon dioxide is a linear molecule, but it has an important vibrational mode in which the molecule bends with the carbon in the middle moving one way and the oxygen atoms on the ends moving the other way, creating some charge separation, a dipole moment, and thus carbon dioxide molecules can absorb IR radiation. Collisions will immediately transfer this energy to heating the surrounding gas. On the other hand, other CO2 molecules will be vibrationally excited by collisions. Roughly 5% of CO2 molecules are vibrationally excited at room temperature and it is this 5% that radiates. A substantial part of the greenhouse effect due to carbon dioxide exists because this vibration is easily excited by infrared radiation. CO2 has two other vibrational modes. The symmetric stretch does not radiate, and the asymmetric stretch is at too high a frequency to be effectively excited by atmospheric temperature collisions, although it does contribute to absorption of IR radiation. The vibrational modes of water are at too high energies to effectively radiate, but do absorb higher frequency IR radiation. Water vapor has a bent shape. It has a permanent dipole moment (the O atom end is electron rich, and the H atoms electron poor) which means that IR light can be emitted and absorbed during rotational transitions (JEB 2002), and these transitions can also be produced by collisional energy transfer. Clouds are also very important infrared absorbers. Therefore, water has multiple effects on infrared radiation, through its vapor phase and through its condensed phases. Other absorbers of significance include methane, nitrous oxide and the chlorofluorocarbons. Discussion of the relative importance of different infrared absorbers is confused by the overlap between the spectral lines due to different gases, widened by pressure broadening. As a result, the absorption due to one gas cannot be thought of as independent of the presence of other gases. One convenient approach is to remove the chosen constituent, leaving all other absorbers, and the temperatures, untouched, and monitoring the infrared radiation escaping to space. The reduction in infrared absorption is then a measure of the importance of that constituent. More precisely, one could define the greenhouse effect (GE) to be the difference between the infrared radiation that the surface would radiate to space if there were no atmosphere and the actual infrared radiation escaping to space. Then, one could compute the percentage reduction in GE when a constituent is removed. The table below is computed by this method, using a particular one–dimensional model (GISS–GCM ModelE) of the atmosphere (Lindzen 1991). More recent 3D computations lead to similar results. By this particular measure, water vapor can be thought of as providing 36 percent of the greenhouse effect, and carbon dioxide 9 percent, but the effect of removal of both of these constituents will be greater than 48 percent. An additional proviso is that these numbers are computed holding the cloud distribution fixed. But removing water vapor from the atmosphere while holding clouds fixed is not likely to be physically relevant. In addition, the effects of a given gas are typically non–linear in the amount of that gas, since the absorption by the gas at one level in the atmosphere can remove photons that would otherwise interact with the gas at another altitude. The kinds of estimates presented in the table, while often encountered in the controversies surrounding global warming, must be treated with caution. Different estimates found in different sources typically result from different definitions and do not reflect uncertainties in the underlying radiative transfer. When there is a loop of effects, such as the concentration of a greenhouse gas itself being a function of temperature, there is a feedback. If the effect is to act in the same direction on temperature, it is a positive feedback, and if in the opposite direction it is a negative feedback. Sometimes feedback effects can be on the same cause as the forcing but it can also be via another greenhouse gas or on other effects, such as change in ice cover affecting the planet's albedo. Positive feedbacks do not have to lead to a runaway effect. With radiation from the Earth increasing in proportion to the fourth power of temperature, the feedback effect has to be very strong to cause a runaway effect. An increase in temperature from greenhouse gases leading to increased water vapor, which is a greenhouse gas, causing further warming is a positive feedback (Terradaily 2006). This cannot be a runaway effect or the runaway effect would have occurred long ago. Positive feedback effects are common and can always exist while runaway effects are much rarer and cannot be operating at all times. If the effects from the second iteration of the loop of effects is larger than the effects of the first iteration of the loop this will lead to a self perpetuating effect. If this occurs and the feedback only ends after producing a major temperature increase, it is called a runaway greenhouse effect. A runaway feedback could also occur in the opposite direction leading to an ice age. Runaway feedbacks are bound to stop, since infinite temperatures are not observed. They are allowed to stop due to things like a reducing supply of a greenhouse gas, or a phase change of the gas, or ice cover reducing towards zero or increasing toward a large size that is difficult to increase. The runaway greenhouse effect could also be caused by liberation of methane gas from hydrates by global warming if there are sufficient hydrates close to unstable conditions. It has been speculated that the Permian–Triassic extinction event was caused by such a runaway effect (Racki and Wignall 2005). It is also thought that larger area of heat absorbing black soil could be exposed as the permafrost retreats and large quantities of methane could be released from the Siberian tundra as it begins to thaw (Pearce 2006), methane being 25 times more potent a greenhouse gas than carbon dioxide (Miller 2000). A runaway greenhouse effect involving CO2 and water vapor may have occurred on Venus. On Venus today there is little water vapor in the atmosphere. If water vapor did contribute to the warmth of Venus at one time, this water is thought to have escaped to space. Venus is sufficiently strongly heated by the Sun that water vapor can rise much higher in the atmosphere and is split into hydrogen and oxygen by ultraviolet light. The hydrogen can then escape from the atmosphere and the oxygen recombines. Carbon dioxide, the dominant greenhouse gas in the current atmosphere of Venus, likely owes its larger concentration to the weakness of carbon recycling as compared to Earth, where the carbon dioxide emitted from volcanoes is efficiently subducted into the Earth by plate tectonics on geologic time scales (JTG 2006). Because of the greenhouse effect, a significant increase in greenhouse gases should translate to increase in global mean temperature. Currently, there is a view among many scientists and layman that there is indeed an increase in globally averaged temperatures since the mid-20th century and that it is most likely a result of an observed increase in anthropogenic greenhouse gas concentrations (IPCC 2007). However, other scientists and layman contend that present temperature increases are part of a natural cycle of temperature fluctuations, seen throughout geologic history, and not part of anthropogenic effects, and that carbon dioxide levels have not increased enough to make a significant temperature difference. A seemingly smaller group of scientists contend that there is not even a consistent increase in global mean temperatures, but observed increases are an artifact of the way temperatures are measured. The ice core data from over the past 800,000 years does show that carbon dioxide has varied from values as low as 180 parts per million (ppm) to the pre–industrial level of 270 ppm. Measurements of carbon dioxide amounts from Mauna Loa observatory show that CO2 has increased from about 313 ppm (parts per million) in 1960 to about 380 ppm in 2005 (Hileman 2005). The current concentration of CO2 is 27% higher than the pre–industrial level and is higher than that of any time in the last 800,000 years history of the earth (Amos 2006). CO2 production from increased industrial activity (fossil fuel burning) and other human activities such as cement production, biomass burning, and tropical deforestation has increased the CO2 concentrations in the atmosphere. Certain paleoclimatologists consider variations in carbon dioxide to be a fundamental factor in controlling climate variations over this time scale (Browen 2005). However, other greenhouse gases like CFCs, methane, and nitrous oxide have also risen substantially in the recent decade (Miller 2000). Methane is produced when methanogenic bacteria utilize organic matter in moist places that lack oxygen. The most favorable sites of methane productions are swamps and other natural wetlands, paddy fields, landfills, as well as the intestines of ruminants, termites, and so forth. CFCs are already banned, but the previously introduced enormous amount is still active. Nitrous oxide is released in the atmosphere from burning biomass, nitrogen rich fossil fuel (especially the coal), nylon production, denitrification process in organic substance and nitrate containing anaerobic soils and water bodies. Although molecules of CFCs, methane, and nitrous oxide absorbs and radiate much more infrared per molecule than CO2, the much larger input of CO2 makes it the most important greenhouse gas produced by human activities. However, it should be noted that temperatures have cycled significantly during geologic history and even in the past 800,000 years, such as the Younger Dryas (10,000–11,000 BP, a time of relatively abrupt cold climate conditions); Holocene Climatic Optimum (Holocene thermal maximum ~7000 BP–3000 BP); Medieval Warm Period (900–1300 C.E. ); Little Ice Age (1300–1800 C.E. ), and Year without a summer (1816 C.E.). Some scientists contend that there is presently a warming period but that it is part of such normal cycles and not a result of an increase in greenhouse gases. Amos, J. 2006. Deep ice tells long climate story. BBC News. Retrieved December 10, 2007. Bowen, M. 2005. Thin Ice: Unlocking the Secrets of Climate in the World's Highest Mountains. Henry Holt & Company, Incorporated. ISBN 9780805064438. Fraser, A. B. n.d. Bad greenhouse. College of Earth and Mineral Sciences, Pennsylvania State University. Retrieved December 10, 2007. Hileman, B. 2005. Ice core record cxtended: Analyses of trapped air show current CO2 at highest level in 650,000 years. Climate Change 83(48): 7. Retrieved December 10, 2007. Iacono, A. 2006. Greenhouse effect, climate change, and Kyoto Protocol. Environmental Problems and Sustainability. Retrieved December 10, 2007. IPCC. 2007. Historical overview of climate change science. Intergovernmental Panel on Climate Change, Fourth Assessment Report. Retrieved December 21, 2007. JEB. 2002. Greenhouse effect. NumberWatch.co.uk. Retrieved December 10, 2007. JTG. 2006. Venus. Journey through the Galaxy. Retrieved December 10, 2007. Lindzen, R.S. 1991. Water vapor: feedback or forcing?. Quart. J. Roy. Met. Soc. 117: 651–652. Retrieved December 21, 2007. Miller, G. T. 2000. Sustaining the Earth: An Integrated Approach, 4th edition. Brooks/Cole Publishing Company. New York. Pearce.F. 2006. Climate change: One degree and we're done for. Special Report Earth. New Scientist. Retrieved December 10, 2007. Racki, G. and P. B. Wignall. 2005. Chapter 10. Late Permian double-phased mass extinction and volcanism: an oceanographic perspective. Developments in Palaeontology and Stratigraphy 20: 263–297. Retrieved December 10, 2007. Terradaily. 2006. Greenhouse gas temp feedback mechanism may raise warming further. Climate Science. Terradaily. Retrieved December 10, 2007. Yuri, M. 1998. Earth radiation budget. Environmental Science, Rutgers, The University of New Jersey. Retrieved December 10, 2007. Wood, R. W. 1909. Note on the theory of the greenhouse. Philosophical Magazine 17: 319–320. Retrieved December 10, 2007. This page was last modified on 22 October 2008, at 18:13.